Partner(s): Lila (presumed deceased) Height: 6'3"
Born in Coesbur, Kehsu's elder sister Aine is the mother of Gedion and Benning, whom are Khesu's neices. As a youth he was eager to learn the warrior ways and to be trained as a fighter like his father before him. Thus he was fostered in Trondc for training. Unlike some fighters, his talent lay more in his agility than in brute strength. He took part in the Second Ice War, earning himself half a score of kill marks, and a couple more since then for slaying Reapers. He is also passable with the use of a bow. 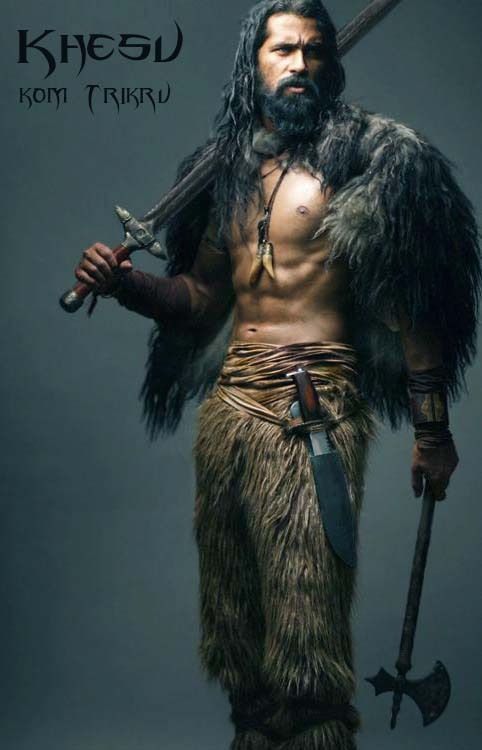 To his clan, Khesu is a dependable hunter who provides meat, skins for leather, and furs to his people. He is known as a quiet, steady man who's word is solid. A fighter for his clan, he also sometimes acts as scout and tracker. Drawing and the application of body paint abide Khesu for his creative outlet. Three years ago, Khesu took a houmon. Lila was a feisty and beautiful woman a few years younger than himself. She was a healer by training who was a midwife and a teacher of the clan's children to read. She was due to deliver Khesu a child by spring. Instead, in early winter she went missing. Khesu has sought any sign or word of Lila these past 6 months and more. He searched the woodlands, and even the snowy mountains. Did the Mountain Men take her? Or the Reapers? Another clan? Khesu has found no trace and grieves for her loss as well as for their unborn child. His houmon presumed dead, Khesu has been in mourning. Recently he took to the north for to search for rare herbs for his sister's husband's healing arts. Now he returns to his people, lured back by strange and worrisome rumors among the clans. Strangers in the land, stars that fall from the sky, and rumors of Reapers and sickness. Coesbur destroyed! Standing around 6'3" this man is well fit and dusky of skin tone. Dark brown or black hair is long but often tied back from his face when he fights or has work to do, or when the weather is hot. 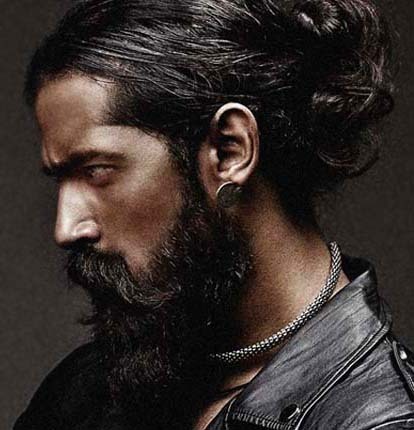 A thick full beard covers his lower face, sometimes braided. High cheekbones are matched with a broad jaw and very dark, watchful eyes. Long fingered hands are calloused from labor, yet he moves with quiet strength and agility. If he speaks, his baritone is low. 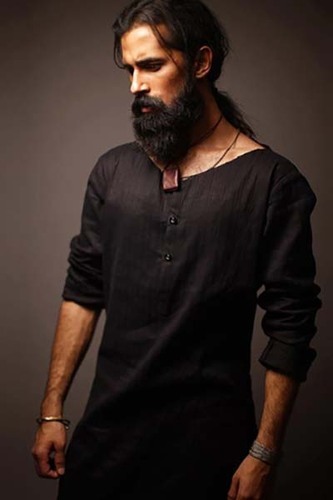 Khesu wears a well made pair of dark brown oiled leather leggings with a large knife on his belt. Simple ornaments, carved bone, teeth, a small piece of hammered copper, are worn on thin leather cords over his chest layered so not to make noise when he moves. Cloth and leather are often worn as bracers over his forearms. A modest number of scars mar his body and over the backs of his shoulders are at least a dozen kill mark tattoos. With his torso bare in summer heat, soft brown boots shod his feet. A little more than a dozen kill marks are tattooed as claw mark slashes over the backs of his shoulders. Most of them from the Second Ice War. Various older scars to his torso, arms and legs from the Second Ice War. Recent sword scars from fighting with Reapers in the Mountain tunnels. Head and chest. Recent bullet wound scars to chest, neck and left side of his brow. Pontus kom Trikru : Fellow veteran of the Second Ice War - only he got the raw end of that by far. Deals with it well, good man and a good friend. He and I think much alike. He is like a brother to me. Starling kom Trikru : Armor smith and clothier, she was Lila's closest friend. Strong willed when she wants to be but a bit too clingy for my taste. She has made me a good set of armor and has my thanks for it, and for what she is to Pontus. Kai kom Trikru : Strange, a Skaikru who prefers our ways and has left her own people to become Trikru. She is brave and honorable, though she could be a little less reckless. Youth. If she lives she will make a fine Warrior. Britt kom Trikru : A capable, rational warrior and a woman whom I respect. I trust her for she has good sense. Galle kom Trikru : She is both a very good healer and a hell of a good looking woman. Despite her sharp tongue, I admire her skill and her wit. Luther kom Trikru : A solid warrior. He did well in the Mountain assault, though perhaps he talks a lot at times. Sage kom Trikru : She was among the Trikru prisoners within the Mountain. I remember how she helped free from the tree that had fallen and pinned me back in the spring when I sought for my missing Houmon. Turns out she'd found Lila and sent my son to Tondc. Gideon kom Nokru : Aine's eldest daughter and my niece. She is an archer and scout. Unfortunately she's also easily swayed by anything new and shiny and has taken a Skaikru for her Houmon in a very short time. For this and more she is no longer a Trikru and I grieve for that loss, but everyone must find their own way. I still care and worry for her. Benning kom Trikru : Aine's younger daughter and my niece. She is an archer and fletcher whom seems to have good sense. She is capable, making up for her small frame. I look out for her but really, she takes good care of herself. Many of the Skaikru are young, emotional, and foolish - not to be trusted. There are a few good ones, perhaps. Richael kom Skaikru : A good looking young woman among the Skaikru who is able to keep her head under stress. Inside of the Mountain she was invaluable for her knowledge of electronics and destroyed the Maunon's missiles. Kasandra kom Skaikru : Another good looking young woman, but one who is pushy and thinks to command me? No, I think not. I refused to teach her the blade when she demanded it of me. She could stand to learn patience and tact. Lionel kom Skairkru : A man to whom I owe respect both for what he did on the Mountain assault, and for his aid unto myself when I fell in combat. I do not know him but he seems a worthy warrior even though he uses a gun. Jumar kom Skairkru : One who interests me, this man is very intelligent. He is a maker who works with metals and electronics. It is he who explained the wire wall and electricity to me, and showed me around Camp Jaha, as well as their vehicles. 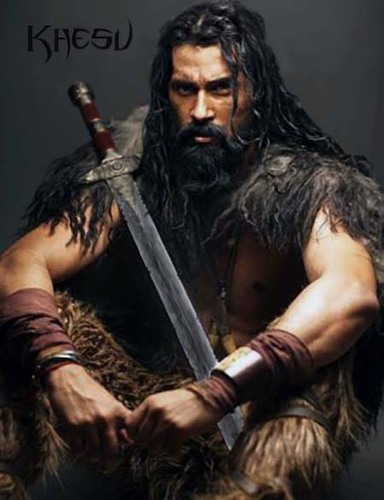 Morgan kom Skairkru : I am told he is a healer, and he did tend to me in combat. I'm not certain that he has very good sense and seems to be an emotional man who does not follow orders of those in command. Elias kom Skairkru : Another intelligent man, this one grows plants and built his hot house with things called 'solar panels'. He explained these to me and also showed me a 'magnifying glass' and it's uses to see small things closer or to start a flame. I think he would make a good teacher of the young. He is Kai's Niron or Houmon.